Lassithi plateau in Crete, one of the few areas in the Mediterranean featuring permanent residents at a high altitude – over 800 meters – covers an area of approximately 25,000 sq kilometres. It is a colourful patchwork of fertile green and yellow fields, encircled by high mountain ranges and irrigated by windmills that compose a very scenic and unique visual phenomenon. Lassithi plateau has been inhabited since the Neolithic Era according to the several sites and findings of the numerous excavations that took place in this area. The Minoans and later the Dorians have been farming the plateau, but during the Venetian occupation the Cretans did not have access to these areas. It was in 1543 that Greek refugees from the Turkish occupied mainland came here and resettled the region, re-establishing orchards and vineyards. 10,000 windmills were built during the 1800s, and although only few of them are used today, their white sails offer a splendid sight. 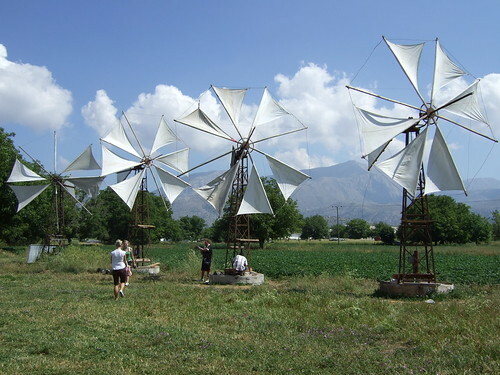 There is much interest in restoring these windmills today, and many of these projects aspire to restoring the authentic picture of the plateau. The valley of Lassithi Plateau is much cooler than the rest of the areas in Crete at night, providing an excellent spot for vineyards. The entire land is extremely fertile though; it is a crater like land producing a large variety of vegetables and fruits. Lassithi boasts a long and very interesting history; the caves of Psychro are found here; they were cult caves used in the Minoan Era, as part of their religious beliefs and practices. Close to the village of Psychro is the Dikteon Andron ( Dikteon Cave) the place where according to the myth, Zeus was born and brought up by Amaltheia and the Kouretes and where later on Zeus coupled with Europe. The cave is though quite interesting itself, with its stalagmites and stalactites, while silence is merely predominant. Lassithi plateau features a large number of villages that preserve their traditional style and colors. You can come with your hire car from Heraklion or Agios Nikolaos and drive along or across them; you can visit the Monastery of Kera, infamous for the lovely frescoes, or simply see the villages that will give you a very good idea of how Lassithi used to be.